Soft, slightly sweet crescent rolls are easy to make from scratch. They are perfect for the holidays or just because. Make a batch and fall in love! 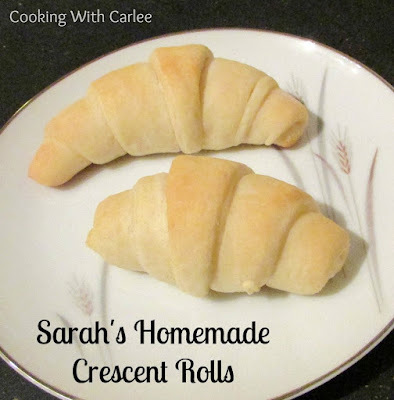 These crescent rolls are delicious, easy and the recipe makes a ton! They are just a little bit sweet and very soft and light. You are going to love their buttery flavor and the fact that you know everything that went into them. Added bonus: no jumping when the tube pops! MiMi got this recipe from a family friend, Sarah. She said it is her grandma's recipe and it is a holiday meal staple. I can see why! The dough was really easy to make. After the first rise, you divide the dough into fourths and each of those get rolled and cut into 12 triangles. I only made one ball of dough, or 12 rolls, at a time. I wrapped the other three balls in plastic wrap and placed them in a freezer bag in the freezer. Then when I wanted fresh crescents, I just thawed a ball of dough and proceeded from there. One ball of dough came out of the freezer the next day! It worked out great as a test. I used one of the balls of dough a couple of weeks later in a recipe I was developing and that one turned out great! I can see there being perpetual balls of crescent dough in my freezer now. It was really easy to make and the possibilities are endless! 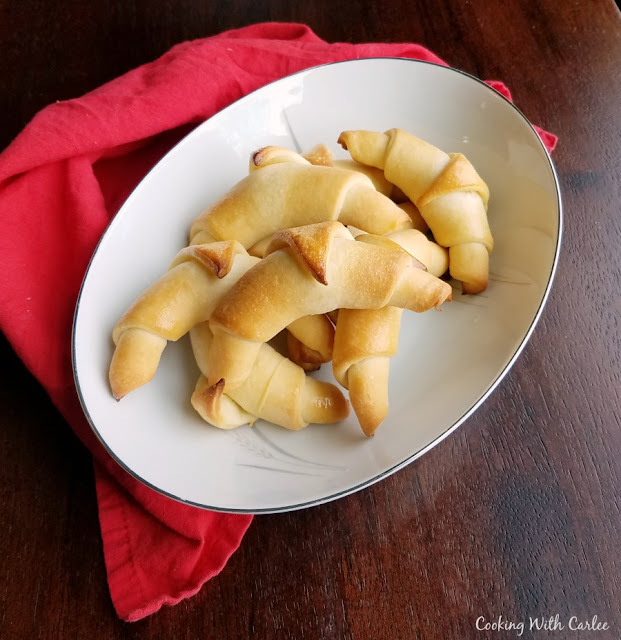 These crescent rolls are delicious, easy and the recipe makes a ton! They are just a little bit sweet and very soft and light. You are going to love their buttery flavor and the fact that you know everything that went into them. Dissolve yeast in the water, set aside. In your stand mixer, combine the melted butter, sugar and salt. Lightly beat 2 eggs and add to butter mixture. Stir in milk and yeast mixture. Place in a warm buttered bowl and let rise until doubled. Punch down and work into a ball. Cut into quarters. Brush each "slice" with melted butter, then roll starting from the wide side toward the point. Place on a baking sheet. Cover with a slightly damp towel and let rise until almost doubled. Gently brush tops of rolls with melted butter, then bake for about 8 minutes or until golden brown. Best when served warm. You can freeze additional balls of dough until you are ready to use them. Just allow to thaw overnight in the refrigerator, roll, cut and rise like normal. It is also possible to form the crescents and freeze them on a sheet pan. Then move them to a zippered bag and store in the freezer. The night before you'd like to use them place them on a baking sheet and cover with greased plastic wrap. Place in refrigerator to defrost. About a half hour before you'd like to use them, move them to the counter to finish rising and then bake off. I can't wait to make these. I thought about making them many times since Sarah shared the recipe with me but didn't realize how easy they are to make. I was surprised how many rolls the recipe makes. Me too! They were really easy and good! The ones from the freezer came out really well too. Thanks for passing the recipe along. Thank you! They are so good, I hope you try them and love them! I would like to see more crock pot recipes or a few freezer meals! :) Can't wait to try these crescent rolls. Great ideas! I don't have a ton of freezer or crock pot meals posted yet. I will have to work on getting more of those! I hope you love the crescents. Oh my mind is racing with possibilities for these. So many things I could make (or just devour them as is). Thanks for sharing on the Creative K Kids Tasty Tuesdays Linky Party. Hope you will join us next week. Isn't it fun to know how easy it is? I have lots of plans for these too! My grandma used to make something so very similar to these that I had completely forgotten about. I have to see if I can find that recipe! Thank you for reminding me of such a loved recipe. How fun! I hope you can find it! Will be trying these this weekend. They look delicious! Ah! How exciting! I hope you love them. These are beautiful Crescent Rolls! Thank you so much for sharing with us at Full Plate Thursday and have a great day! Thanks Miz Helen! The last of the four balls of dough got used up tonight, time to make more! Thanks for hosting! They are so good and it has been really handy having the extra dough in the freezer. It's time to make more! Thank you for hosting! Oh my goodness, I love crescent rolls and I just bet these are divine! Thank you for sharing with us at Totally Terrific Tuesday Link Party. Can't wait to see what you've been cooking up this week! I had so much fun using this batch of dough. Time to make another! This sounds so easy and yummy! They really are easy, not much more work than popping the can and so much fresher! Thanks for hosting, Jess! Hi Carlee! I am a crescent freak and have ALWAYS wanted to try making my own - thanks for putting the recipe at my fingertips!! Thanks for linking up at #HappinessIsHomemade with us this week, I always look forward to your posts! You totally should give it a try, Katie! They are so much easier than I thought they would be. Plus I loved having the dough in the freezer. Of course it didn't last too long in there before I used it all up! What a great recipe!! I can't believe you can freeze the dough...Thanks for sharing on My 2 Favorite Things on Thursday! Pinned! I figured it was worth a try! It works for pizza dough, why not this? I'm glad it did work out. I plan on always having some on supply! Pinning and tweeting to share! We will be trying these soon :) Thank you for sharing your recipe with us at Snickerdoodle Sunday! Thank you! They are so good, and easy too! I hope you love them. They are so good! I love how soft and airy they turn out. Thanks for stopping by! 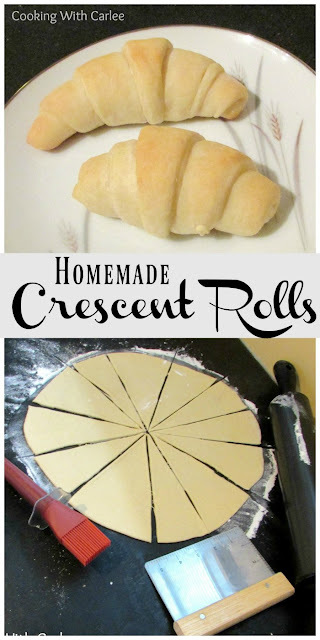 My kids love crescent rolls, these look so good, I will have to give it a try! Thanks for sharing at What'd You Do This Weekend?! Thank you! I hope you do and that you love them! These look so yummy! 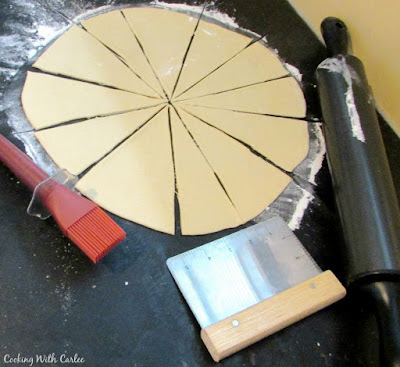 Great idea to freeze some dough and have it handy. These will be a big hit in my family! Think I'll try making them for Christmas dinner. They are so soft and buttery and good! I hope you love them! They are! So fluffy and buttery and scrumptious! These crescent rolls look heavenly! I can smell the butter! Doesn't it just draw you right in? I used to make homemade cresents all of the time, but had forgotten about them! These are totally going on my Thanksgiving table! About how long do these take to rise? It will depend on the temperature of your house, but about an hour.